The Aston Martin V12 Vantage Roadster 2013 recently made its debut in London, revealing its price, performance figures and availability. 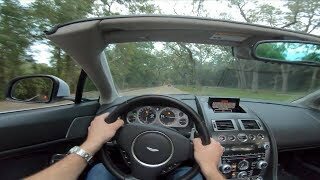 Aston Martin claims that the Roadster is designed to provide "full sensory overload" and if that claim doesn't make you curious about what this car is all about, then I don't know what is. 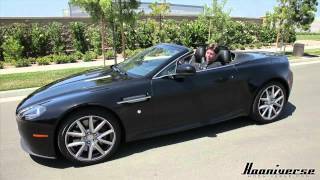 First things first, let's take a look under the hood and see what motivates Aston Martin's Roadster. As the car's name suggests, a V12 power plant with a capacity of 6.0 liters is the backbone of the car, developing 510 horsepower, 420 lb-ft of torque, a top speed of 190 mph and the ability to accelerate from 0 to 61 mph in 4.5 seconds (0.3 seconds slower than the coupe). The 6.0 liter unit is coupled with a six-speed manual transmission and just as its hardtop counterpart the Roadster benefits from a button that enables the driver to switch between two different driving modes, one of which is the "Sport mode" which sharpens throttle response. In terms of exterior design the Roadster has been slightly redesigned, mainly at the lower front air intake and the trunk lid. Furthermore the 2013 model features some carbon fiber elements such as the side strakes, the rear diffuser, carbon fiber mirror caps and front splitter. Last but not least, the 2013 model comes with a brand new set of forged alloy wheels. However, these written words don't make it justice, because the overall looks are simply stunning. It would really take a few thousand words to describe the Roadster's amazing looks, so feel free to check the pictures instead. As far as production goes, at first only 101 units will be built over a time period of nine months, but the first Aston Martin V12 Vantage Roadster 2013 units are expected to make their way in UK showrooms during Q4 this year. It's a bit too early for an exact price tag, but the expected price should be somewhere around £150,000 (roughly $233,000 US). Availability-wise, no information has been given regarding the U.S., but we hope the Roadster will make its way in these parts as well. Key competitors include the Mercedes Benz SLS AMG Roadster, the Ferrari California and the Bentley Continental GTC. A more costly and more powerful alternative could also be the McLaren 12C Spider 2012, but all that extra power will cost roughly £45,000 more.